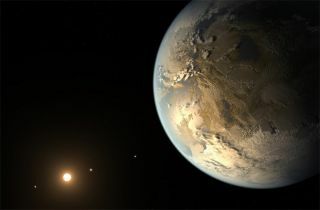 Artist’s illustration of Kepler-186f, an exoplanet similar in size to Earth that appears to orbit in the habitable zone of its parent star. The first "alien Earth" continues to evade detection. On Monday (May 10), astronomers announced the discovery of 1,284 exoplanets by NASA's Kepler space telescope, bringing the prolific observatory's total haul to 2,325 confirmed alien worlds. But none of these appears to be a true Earth twin, mission scientists said. Two of the newly announced worlds — Kepler-1638b and Kepler-1229b — are among the most Earth-like planets yet discovered, Batalha said. Both newfound worlds orbit in their host stars' "habitable zone," that just-right range of distances at which liquid water could likely exist on a planet's surface. And Kepler-1638b orbits a star very much like the sun, but the planet is about 60 percent wider than Earth. Kepler-1229b is just about the same size as Earth, but that alien world orbits a red dwarf, a star considerably smaller and cooler than the sun. Kepler-1638b and Kepler-1229b are therefore similar in size and orbital characteristics to Kepler-452b and Kepler-186f, respectively, Batalha said. The two latter worlds are previously discovered Kepler planets that garnered a lot of attention for their similarity to Earth. Astronomers have discovered a total of about 3,200 exoplanets since the first world beyond Earth's solar system was spotted, in 1992. The most Earth-like of all of these are GJ 667Cc and Kepler-442b, according to the Earth Similarity Index (ESI), a metric devised by researchers at the University of Puerto Rico at Arecibo's Planetary Habitability Lab that takes into account an exoplanet's mass, radius, estimated surface temperature and other factors. Finding Earth-like planets is at the heart of the $600 million Kepler mission, which kicked off with the observatory's March 2009 launch. Kepler's main goals are to find Earth-size exoplanets in and around the habitable zone, and to determine how commonly such worlds occur throughout the Milky Way galaxy, a value known as "eta-Earth." Kepler initially eyed more than 150,000 stars simultaneously, looking for tiny brightness dips caused by orbiting worlds crossing the faces of these stars. Such work required ultraprecise pointing ability, an ability Kepler lost in May 2013, when the second of the telescope's four orientation-maintaining reaction wheels failed. That failure brought Kepler's original planet hunt to an end. But scientists are still poring over the observatory's huge data set; indeed, the 1,284 newly validated planets are former "candidates" identified by Kepler through May 2013. The Kepler team will continue such validation work through at least October 2017, when the original mission "closes out" and the final discovery catalog — and the most important extrapolations made from that catalog — are due. The most eagerly anticipated such extrapolation is eta-Earth. Kepler observations analyzed to date suggest that this figure is about 25 percent, meaning that one-quarter of the 70 billion or so "normal" (main-sequence) stars in the galaxy appear to host rocky planets in their habitable zones, Batalha said. The telescope's finds are also helping to guide future missions, such as the Transiting Exoplanet Survey Satellite (TESS) and the James Webb Space Telescope (JWST), NASA efforts that are scheduled to launch in 2017 and 2018, respectively, she added. TESS is designed to find nearby exoplanets whose atmospheres JWST could conceivably search for signs of life. Shortly after the May 2013 reaction-wheel failure, Kepler team members figured out how to stabilize the observatory using sunlight pressure and the remaining two wheels. In 2014, Kepler embarked upon a new mission, known as K2. The spacecraft continues to hunt for planets during K2, though on a more limited basis, and it has broadened its observing scope to include supernova explosions, asteroids, and other celestial objects and phenomena. Kepler has found a few dozen confirmed planets during K2, along with several hundred candidates that await validation, Batalha said. And that number could continue to grow for a while. "Right now, I think that everything is looking good with the spacecraft," Kepler/K2 mission manager Charlie Sobeck, also of NASA Ames, said during Monday's news conference. "The two remaining [reaction] wheels look to be excellent. They're in good health," Sobeck added. "So the K2 mission is ultimately going to be constrained by fuel. And right now, my estimate is going to be something over two more years' worth of fuel. So, sometime [in the] middle of summer of 2018 is when I think that we may run out."